The Yellow & Black Detailed Boxing Shorts sports a very bright shade of yellow that has stark black flame print detailing on the body. 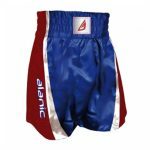 This super impactful piece is perfect from pro boxers as well as the beginners and intermediates that are looking for inspirational and attractive boxing clothing. The fabric of this option is very comfortable and durable at the same time.